The species is distributed in Asia Minor, Iran,and Southern Transcaucasia. In Armenia this monotypic species occurs in Central and Southern regions, where inhabits semi-deserts and dry mountain steppes at the elevation between 900 and 2200 m a.s.l. The host plant of the species is not yet identified, probably it uses various Gramineae, since in the field the oviposition was recorded on different grasses, as well as on nearby stones, and in laboratory conditions the females also lay their eggs on several different species . The Orange Hermit flies from late June till late August in one generation. The species is usually rare even within typical habitat, although in some years it gives outbreaks. During 2003-2013 it demonstrates stable distribution trend (p>0.05), which could be result of some adaptability of the species, but also it is possible that population change for Orange Hermit is visible on longer periods of time. There is some trade of the species; however its influence on the species' population has not yet been studied. The species is not included in the Global, European, and National Red Lists, as well as in CITES and Bern Conventions. 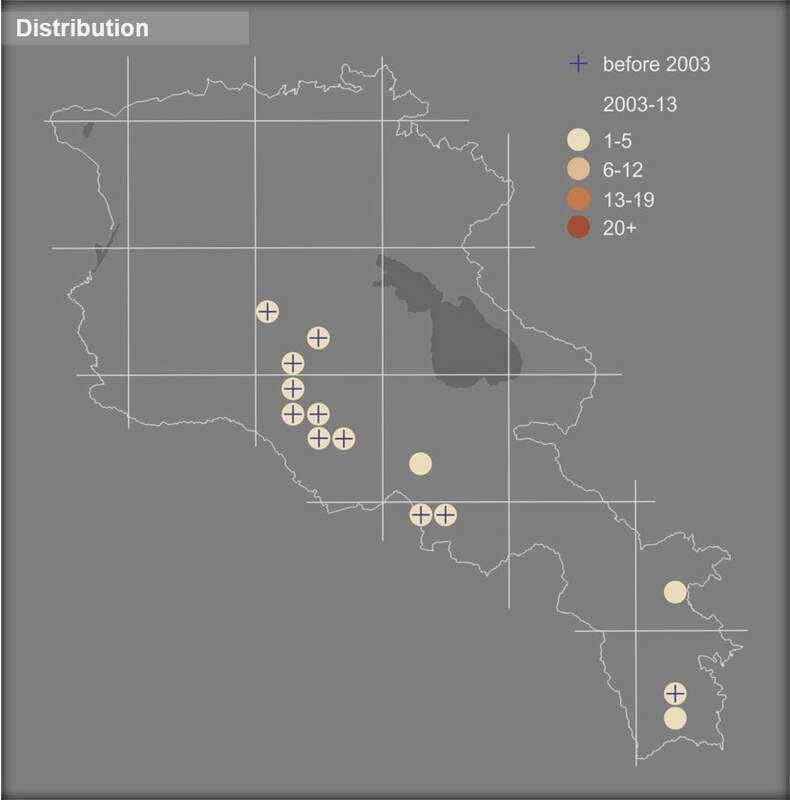 Preliminary assessment of its conservation status for Armenia suggests it as Least Concern. The Orange Hermit's distribution is partly covered by Zangezur Biosphere Complex, Gnishik Protected Landscape, and Khosrov Forest State Reserve, as well as by appropriate Emerald Sites. Also it is presented in Prime Butterfly Areas Shvanidzor, Gyumorats, Gnisheek, and Ourtsadzor. At current obviously there is no need for development of conservation measures for Orange Hermit, however, it is important to continue the monitoring of this habitat specialist.